Off to Trader Joe's for dried sour cherries, which will now be 8 years in a row. I've made this annually since the recipe was 1st published in Cooking Light. Fantastically easy and flavorful, which is a blessing because you'll be making this a lot, trust me. If you can't find fresh cranberries this time of year, reduce the water and sugar to 1/2 cup each. 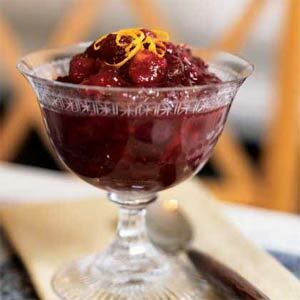 Stir in 1 can of cranberry sauce with berries and remove from heat. Continue with directions. Serve cold, or room temperature. Combine first 4 ingredients in a medium saucepan; bring to a boil. Add cherries, and cook 1 minute. Stir in cranberries; bring to a boil. Reduce heat, and simmer 10 minutes or until cranberries pop. Remove from heat. Stir in walnuts, grated rind, and extract. Garnish with orange rind strips, if desired. Cover and chill.